feet tall. They are a spectacular sight and we often wander around venues to generate a following! We are constantly looking for new and exciting events to be involved in and if you are interested in finding out more then we would love to hear from you. 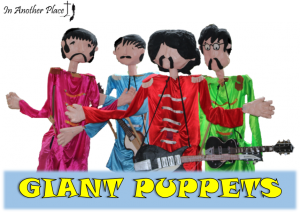 If you would like to hire our Giant Puppets for your own use then feel free to get in touch too. If you would like to know more about how we make our puppets and perhaps even learn how to make your own, we also run Giant Puppet workshops. In these sessions we can show you how to make and use the puppets for your own performances.